Isn’t the hiring process frustrating, whether you are the one hiring or someone looking to get hired? David Osborne, is rethinking the hiring using design thinking. He wants to make the matching experience for both candidate and the organization more positive. 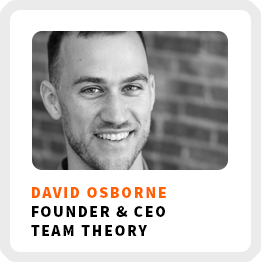 He’s the founder and CEO of Team Theory. He works with companies from across the world to help find candidates who are the best fit to advance his clients’ objectives. He’s not just filling a position. He’s like a therapist and strategist for hiring managers. He helps them get unstuck to get their hiring process back on track by connecting vision with goals and then with the abilities of candidates. Thinking about hiring in the context of goals, not just qualifications. The difference between recruiting and hiring. What we can learn about hiring from dating. How design thinking can build more effective hiring practices. How he tapped into his network to help him narrow the focus of his consulting practice. Wake up time: In colder months, it’s around 7:00am and in the warmer months it’s between 5:00 and 6:00am. Core work activities + habits: 1) Talk to people in various stages of hiring and offer them insight to bring in new business. 2) Working closely with the team and the clients to lead them through the process to help them through being stuck. 3) Thinking big for the future about new ways of engaging more people. Superpower: Being a discerning cheerleader by finding what people can be best at and helping them get there. Regains focus by: Thinking about and writing out his priorities, doing his weekly repeated tasks, or just taking a walk. Favorite productivity tool: Tracking his meetings by type over time as a way to conduct and schedule his meetings more effectively. 90-day goal: Ramp up new partners for the next six months or so, start to test new ideas for products like coaching, and doing more content creation and delivery. 1) Use contact points with your clients to learn more about the problems they have and why they’re having them. 2) Pay attention to the client experience throughout the process. 3) Learn what your clients think in their own words, rather than trying to think for them.